There’s a paradox at the heart of poetry – poets use words to express truths which cannot be expressed in words. How do they do it? The best poets drop words like breadcrumbs that lead us along the path of our own emerging wisdom. Let’s explore their methods, their rhythms, and their poems as they lay bare the sacred significance hidden behind the everyday details of our ordinary lives. With examples from Walt Whitman, Mary Oliver, Rumi, and Hafiz we’ll take away a renewed appreciation for this ancient art form while deepening into the beauty of our own lives.Peter Bolland is the philosophy and humanities department chair and a professor of philosophy and humanities at Southwestern College where he teaches world religions, Asian philosophy, ethics, and world mythology. He also writes a column for both Unity Magazine and the San Diego Troubadour, as well as serving as executive editor for InsideTheBeltway.com, a news and commentary website. 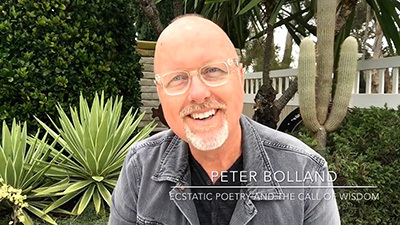 Bolland is also an award-winning singer-songwriter and poet. Click here to let us know you are going (on FB)!